Mick McMahon is a British artist who has ebbed and flowed in and out of the comics industry for 30 years. His work has braced the pages of 2000AD, Toxic!, Tank Girl, Rugrats and Sonic the Comic. But his work has moved well beyond his pages, inspiring some of the most prominent graphic artists in the industry today. Some of the most prominent and successful characters around today owe a debt to McMahon’s constantly evolving style – proving without a doubt his incredible talent. But, more than that, he’s just plain funky. Judge Dredd was created in 1977 to appear in 2000AD by writer John Wagner and artist Carlos Ezquerra, but problems with pre-publication ked to both of the previous creators walking off the project. Both Wagner and Ezquerra would return to the pages of 2000AD and the Dredd himself but in the intervening time the toughest lawman on the streets of Megacity 1 had to be given a face and a pair of boots to stride in. 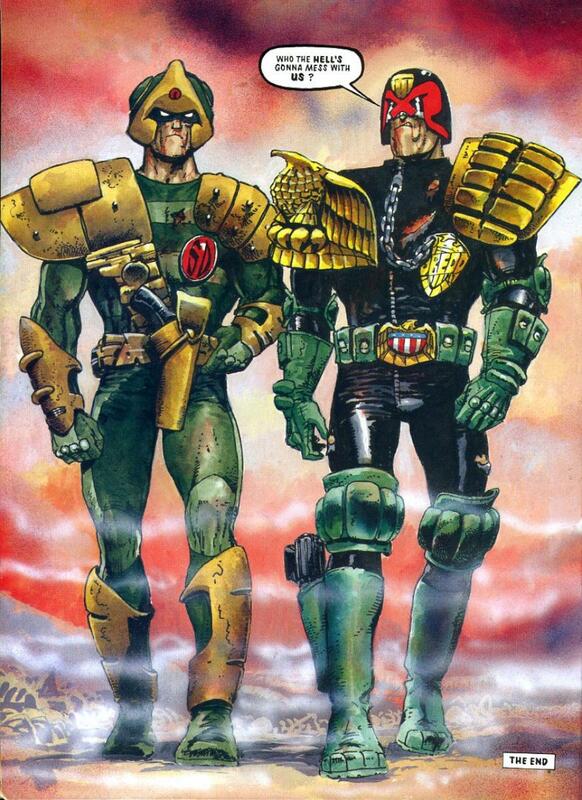 Pat Mills and Peter Harris took over and were responsible for the first published Dredd comic book, and was drawn by an inexperienced yung artist called Mike McMahon. He was chosen primarily by Mills (who was editor at the time) because he could do a passable impression of Ezquerra’s work. However, it didn’t take long for McMahon’s style to take hold. It could’ve been said that he had inherited the greatest British Comic Book character to date by chance but to flip it, perhaps more logically it seems more likely that McMahon developed the lawman to become this. 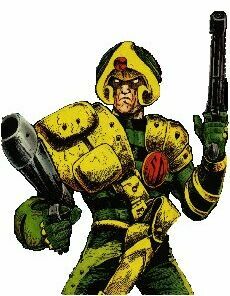 His style, more angular and abstract than Ezquerra’s more organic style; notable for its sharp lines and clear, crisp contours and clearly, nigh caricatured features on the characters he drew became the default with other artists such as Ian Gibson and Brian Bolland taking his lead and introducing their own spin on the way McMahon was developing the character. In the early period of his career, McMahon’s style was characterised by a ‘quick, spontaneous approach that verged on the messy’. 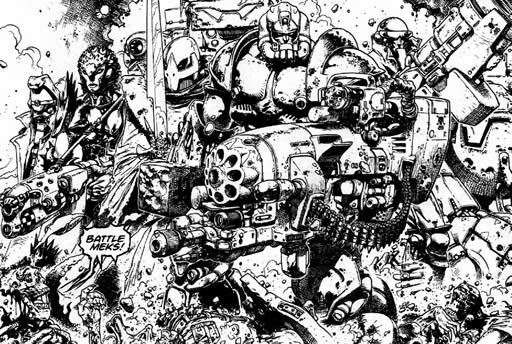 His figures were gaunt compare to Ezquerra and Bolland’s interpretations, with pen lines thrown down spontaneously and hatching completed with a fully-charged brush his work set the bleeding edge of visceral and unrestrained artwork for the environment and content expected in Judge Dredd and 2000AD itself. While John Wagner returned to his creation, McMahon continued on as the lead artist on Judge Dredd. In 1979, taking a break from art droid duties on the Dredd, McMahon began on Pat Mill’s Ro-busters (following a freelance agent pursuing rogue or out of control robots in the future) and the more brutal and savage spin-off, ABC Warriors, alternating with Kevin O’ Neill. While working with O’ Neill, McMahon’s work became tighter and his characters began to become meatier and fuller in stature. McMahon returned to Judge Dredd for ‘The Judge Child’ and introduced high contrast artwork for the following series ‘Block Mania’, separating more clearly black and white in his compositions. Due to complete 9 episodes, McMahon bowed out after only 2 due to the punishing nature of his newfound detailing and Mill’s introduction of extensive crowd scenes for the battle between the blocks depicted in the episodes. The work was completed by Ron Smith, Steve Dillon and Brian Bolland. Having handled 2000ADs primary character, McMahon needed a new character to draw. 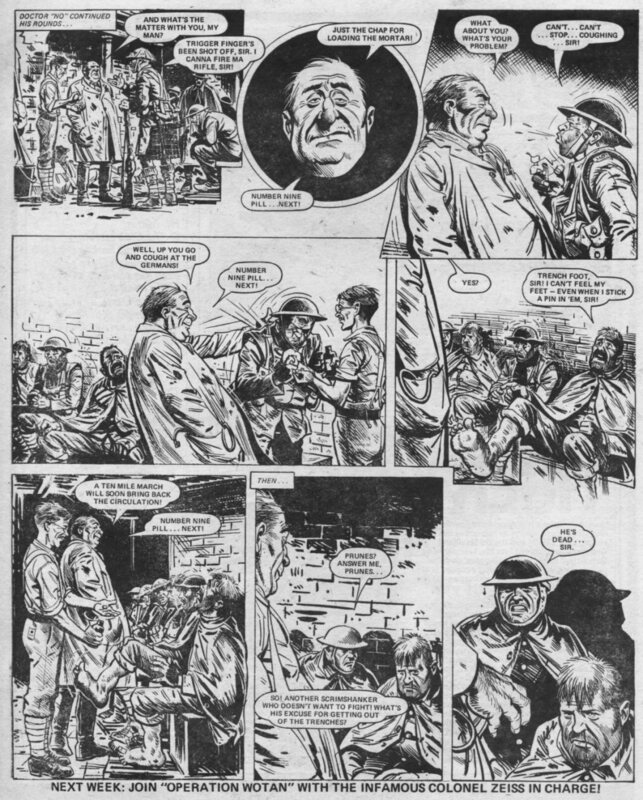 As McMahon returned from a 2 year gap from 2000AD (in which he brought his distinctive style to Doctor Who Magazine), a character that had suffered initial difficulties reared its unwashed celtic head. McMahon met Slaine and applied a new style, unleashed from the sterile science fiction he introduced a more naturalistic, compositional and flared style to his work. The tones were deep and luxurious, the action visceral, uncontained and brutal where necessary and light and human when necessary. His character’s remained grotesques with elongated or extended features but upheld natural structure and anatomy at the same time. McMahon was applying abstraction and realism in equal measure to pages crowded with detail. 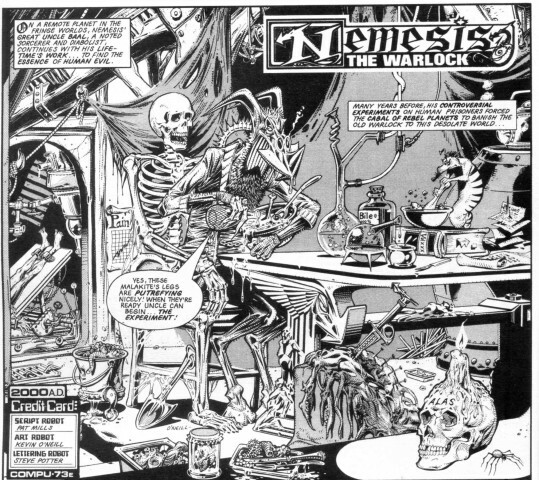 From this McMahon has worked predominantly in games design and his distinctive comic works have become few and far between. He featured in Hellraiser, an Alien Legion One-shot, an unfinished comic strip, ‘Mutomaniac’ in the doomed 2000AD spin-off Toxic!, occasional returns to Judge Dredd and a futuristic take on Batman in Legends of the Dark Knight, all of which saw him with a more simple and flattened style. New depth returned to his work in Sonic the Comic, Tattered Banners for DC Comic’s Vertigo, a return to ABC Warriors and a short Batman Black and White back-up story. He applied his distinctive style to the Marvel Uk/ Panini Rugrats series which was cancelled early on in its run. He returned to the Judge in Prog 1539 of 2000AD. 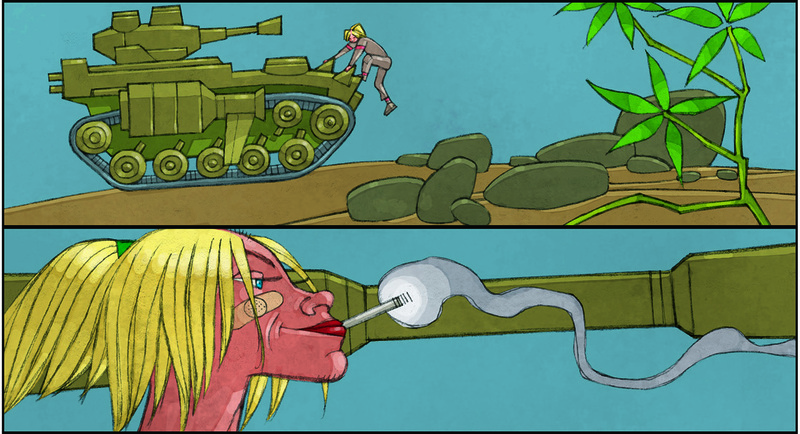 McMahon also worked on Tank Girl (made famous by Jamie Hewlett) -Carioca, a six-part mini series with Tank Girl creator Alan Martin. Mick McMahon’s style drags complacent onlookers out of the read-and-wander-off-the end-of-the-page mind set that is prevalent in modern comic books. His stylism and distinctly vehemently organic style, backed with a consistently evolving and altering pack of methods and techniques which he seems to apply to each and every new project that he comes across has kept his work engaging, relevant and challenging for 30 years and ticking. He is referenced by many influential artists as an inspiration, including Mike Mignola, Jamie Hewlett and Dave Gibbons. His unremitting stylism expanding well beyond the small number of comic works he may have comparatively created. The mark of a true practitioner. 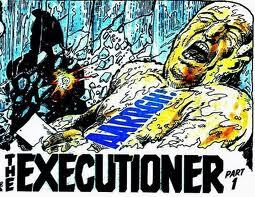 Pat Mills is the ‘Godfather of British Comics’ but also its conscience. In spite of being at the birth of some of the most debilitatingly imaginative and indelible characters to grace the pages of British comics, Mills is driven by his views and beliefs. An iconoclast and sensitive and emotive writer at times he also has a light hearted darkness in his writing. His writing carries a very ‘english’ sardonic and ironic stance to propel his writing with intelligence and brevity while still imparting perspective and opinion. He trusts his readership and as such has seen success after success throughout his career. His books are notable for their violence and anti-authoritarianism but they offer an alternative view to more media friendly fare. Born in 1948, he became a Sub-editor for DC Thomson & Co Ltd (Publisher of 2000AD, Beano and Dandy among others) where he met his perrenial collusionist John Wagner. In 1971 both left to go freelance and bizarrely given their later careers found themselves writing scripts for IPC’s girls’ and humour comics. In an act of delightful subversion seemingly more typical of later projects, both used their positions in the girl’s department as a convenient front to secretly create Battle Picture Weekly, along with Gerry Finley-Day at the request of IPC to offer an alternative to DC Thomson’s Warlord title. More violent and working class, Battle met with great commercial success perhaps as it had more of a plausible and wide reaching perspective than its competitor at DC – but having made it ready for launch, Mills resigned as Editor. Creating a yet more controversial and gritty title in the boy’s title, Action in 1976 the title floundered against media protests in response to its high violence and anti-authoritarinist viewpoint and the title folded within 2 years and merged into Battle. His next creation was the most legendary of all British comic books. The most successful Science fiction weekly in British comic book history was born. 2000AD was launched in 1977. As was typical of Mill’s generous creative stance he developed most of the early series before handing it over to other creators. 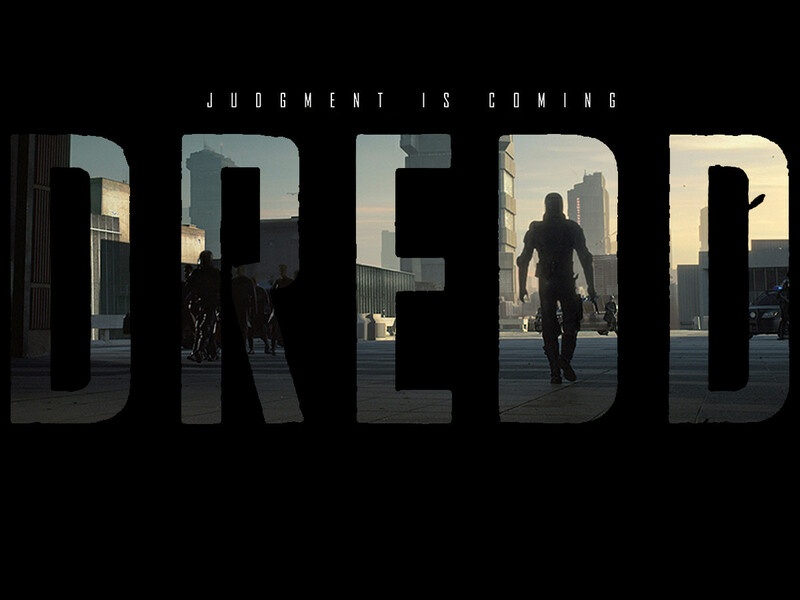 He took over the development of Judge Dredd – 2000ADs most enduring character when John Wagner left. Through the pages of 2000AD, Mills created indelible characters that would pock mark the face of British comics with shell holes, blade wounds and gunfire damage. Developing from Ro-Busters (a series about a robot disaster squad – surely due for a revamp soon) a mini-universe of anti-establishment titles formed taking in the incredibly enjoyable ABC Warriors (Battle droids for hire in a authoritarian universe built to withstand Atomic, Bacterial and Chemical warfare) and culminating in the absurdist Nemisis the Warlock (and incredibly anti-establishment anarchist chaos junky alien warrior). With these, Mills investigated themes of subversion, violence, dictatorship, the destructive nature of unabated imperialism and capitalism but did so with shiny robots and lunatic alien species. This proved Mill’s great ability to imbed clear politics and philosophies into popular culture, aided by Kevin O’ Neill (present for the creation of all three) and greats such as Simon Bisley, Mike McMahon, Brett Ewins and Brendan McCarthy. His chaotic, anarchist tendencies burst out in a warp spasm of celtic might in Slaine, a juicy barbarian fantasy based on Celtic mythology and neo-paganism, which he created with his then wife Angela Kincaid (with whom he also created a series of Children’s books; The Butterfly Children) who he continues to write today with some of the most innovative artists such as Clint Langley and continues to break the boundaries of wild art ever since Simon Bisley’s tenure on Slaine: The Horned God which cemented the title into an ageless classic for future comic book fans. Globally, Mills has broken the US and more successfully (and rewardingly as it had been one of his life goals) the French markets. The first with Marshal Law, a savage superhero satire (common place now) published by Marvel Comics’ Elite imprint in the late 1980s, drawn by O’Neill. The second was cracked with Sha, created with French artist Olivier Ledroit. 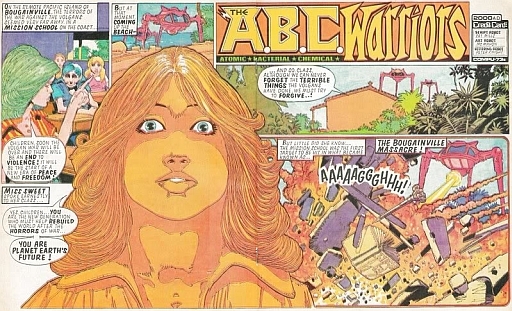 Match that with a hand in IPC’s Horror comics aimed at girls, Chiller, Dice Man, featuring characters from 2000AD and more anarchic and deliberately subversive work such as Crisis (1988-1991) – a politically aware spin-off from 2000AD for older readers (including a Carlos Ezquerra drawn tale, The Third World War, a polemical critique of global capitalism and the way it exploits the developing world). Crisis launched the careers of Garth Ennis, John Smith and Sean Phillips. In 1991, almost in reaction to his own work in Crisis – less politically worthy and anarchic title, Toxic was founded – along with Tony Skinner, including Accident Man (a hired killer who makes every assassination look like an accident). The title lasted less than a year but launched the careers of Duke Mighten and Martin Emond. 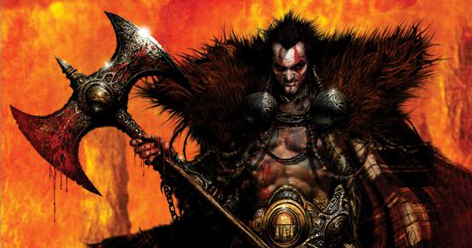 Mills continues to write Slaine, Bill Savage, Black Siddha and ABC Warriors in 2000AD as well as the franco-belgian comic Requiem Vampire Knight, with art by Olivier Ledroit and its spin off Claudia Chevalier Vampire, with art by Franck Tacito. But it is the First World War series Charley’s War, written by Mills and illustrated by Joe Colquhorn reprinted in hard back recently that might live beyond its associated characters. Depicting the days of the First World in brave and unflinching writing and appearing in the pages of Battle from January 1979 to October 1985, Mills made clear through the eyes of his central character, 16 year old Charley Bourne, the reality of that great conflict without diminishing the characters into victims or unrealistic heroes but normal men diligently vying to reach the far end of a savage and clandestine war. His depiction of Shell shock harrowing and poignant it is my firm hope that this piece is offered to future generations to enjoy and understand. More projects continue to appear. Greysuit, a super-powered government agent and Defoe, a 17th century zombie hunter drawn by Leigh Gallagher began recently in 2000AD. 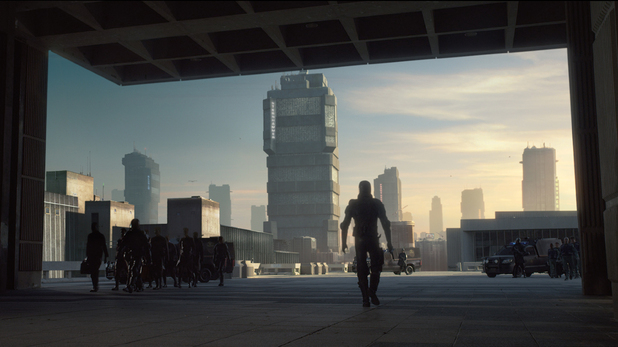 Mills has formed Repeat Offenders with Artist Clint Langley and Jeremy Davis ‘to develop graphic novel concepts with big-screen potential’ – an eventual plug-in to the way the rest of the industry is heading, beginning with American Reaper (optioned by Trudie Styler’s Xingu films), Mills has written the Screenplay. Whatever lies ahead for the Godfather of British comics I hope his future doesn’t lie too heavily in the US or France or Belgium. Because uniquely I think, Pat Mills belongs to us. A writer who personifies, perhaps better than any, what it is to be English. A realist, surrealist, idealist and pragmatist rolled together. With a head nod to the absurd and the edgy and a knowing and wise grip on otherwise difficult or divisive subject matters he sees the light in the dark. His clanking monstrosities battling zombie bikers on Mars carry the same determined fatalism and charm as a mud soaked soldier in the trenches of Charlie’s War. America go hang; we’ve got the Mills.